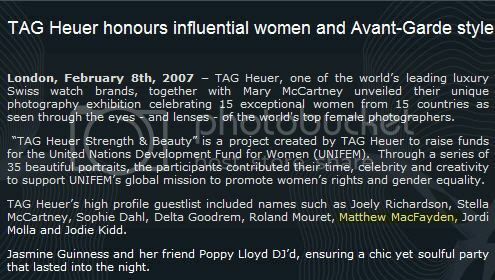 A HUGE thank you to Raquel who notified us of a video showing Matthew and Keeley at the TAG Heuer event, in London on February 8, 2007. You can see Matthew Macfadyen briefly and his wife Keeley a couple of times. Below are some screen captures of the video and Matthew is listed as a profile guest!